[VIDEO] If you are a Democrat and you do not embrace this litmus test, it is a promise by the Democrat National Committee that you will be on your own. DNC Vice Chair Keith Ellison makes it very very clear in the video. It all has to do with supporting illegal aliens and the DREAM Act. This is just another proof that the Democrat Party is the party of identity politics. The Democrat Party has laid claim to the idea that all of their constituents are victims of some sort of oppression. In all cases, the source of this oppression is the Evil United States, the Evil Republican Party, and in many cases, evil white people. DNC Vice Chair Keith Ellison is making no bones about it: the national party has a litmus test for candidates when it comes to protecting illegal aliens. 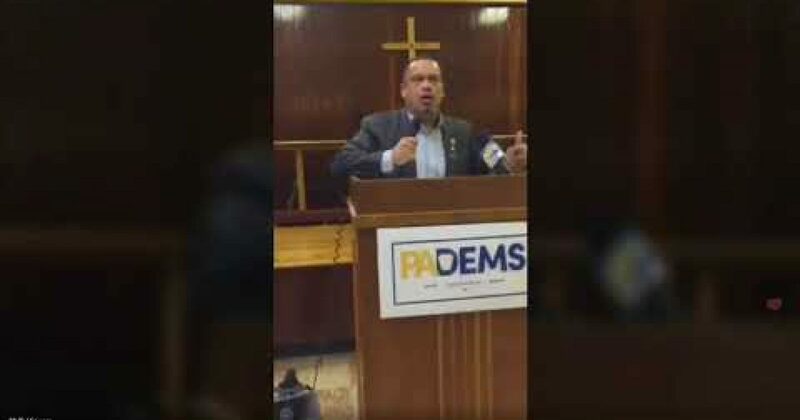 Ellison told Pennsylvania Democrats assembled in a church sanctuary that candidates better support a “clean DREAM Act,” or those candidates would run into trouble with the party. During an event with “Allentown Dreamers” on Friday afternoon, Ellison issued a warning to those who step out of line with the DNC heavies. “There cannot be one single politician in the state of Pennsylvania who is in a state of confusion about how you feel,” he told the audience. “We’re going to make it perfectly clear to all of them on a repeated basis,” he said. “And yes, we have a litmus test,” Ellison declared.